Those who have read the first volume (review here) of Ghost Stories Of An Antiquary by M.R. James, will be pleased to know that the second volume is just as good if not better then the first. This second volume much like the first has stories adapted by Leah Moore and John Reppion to bring to life the stories of M.R. James if in a more condensed format. There is four stories contained in this volume and they range from ghostly apparitions, tales of ill-advised exploration and things that are best left buried. Each story has been illustrated by a different artist as well to add a brilliant variation to the stories. Number 13 is illustrated by George Kambadais and answers a mans question as to why there is no room 13 in his hotel...or is there? Count Magnus follows our main character as he goes in search of the history of Count Magnus until he finds out a bit more then he would like. This is illustrated by Abigail Larson and the colours are quite gloomy adding to the mystery of the count. Story three illustrated by Al Davison is called Oh,Whistle, and I'll Come To You, My Lad. Quite an interesting story of a man who finds an old whistle and upon blowing it calls something less friendly then your pet dog. The last story, The Treasure Of Abbot Thomas is illustrated by Meghan Hetrick and if you are a fan of Dan Brown (The Da Vinci Code) you will get a real kick out of this story. If you have never read anything by M.R. James then these graphic novels released by SelfMadeHero are a good introduction. It is also worth mentioning that the stories featured in volume 1 and 2 are adaptations of what was featured in the original printing of Ghost Stories Of An Antiquary back in 1904. That shows how well the stories are written because over 100 years later his stories are still being printed and read. With these graphic novels it brings his stories to a whole new audience and that is never a bad thing. 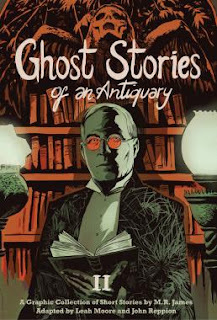 Ghost Stories Of An Antiquary: Volume 2 is published by SelfMadeHero and is out now. (80pp, colour, paperback, rrp £9.99).